Montana's famed salmonfly hatch ranks as highly as Bigfoot with the number of myths and legends that it spawns. This massive insect is impossible to ignore and is most likely the only arthropod that produces an addiction within the fly fishing community that is stronger than caffeine and nicotine combined. The salmonfly is a large stone fly (Pteronarcys californica) with an orange hued abdomen that inhabits heavy riffles of large freestone rivers in across the Western United States. The large insect spends 3 years living as a nymph in boulder strewn heavy riffles before crawling to the banks just after run off has ended in the early summer. Salmonflies are huge insects and adults can reach three inches in length. The hatch is very short lived on a given reach of water but the timing of the hatch is varies by river. Early hatches occur in late May and late hatches on colder rivers extends into early July. Although the hatch is found from New Mexico to Oregon, many of North America's famous "big bug" rivers including the Madison, Yellowstone, Gallatin, Big Hole, Rock Creek and Smith are in Montana. Due to the large number of salmonfly rivers in Southwest Montana, the Big Sky state is an ideal location to chase the large insects due to the fact that they are usually hatching somewhere during a 6 week period from mid May to early July. The widespread publicity that the hatch receives often generates unrealistic expectations for visiting fly fisherman. Our group of Montana fly fishing guides spends a significant amount of every early summer targeting the salmonlfly and have come to recognized a few "truth"s of the hatch. This is the truth that feeds every salmonlfy junkie's addiction. The largest trout in the river, the lunkers ranging from 23-30+ inches don't waste their time eating dainty little mayflies and caddis flies. 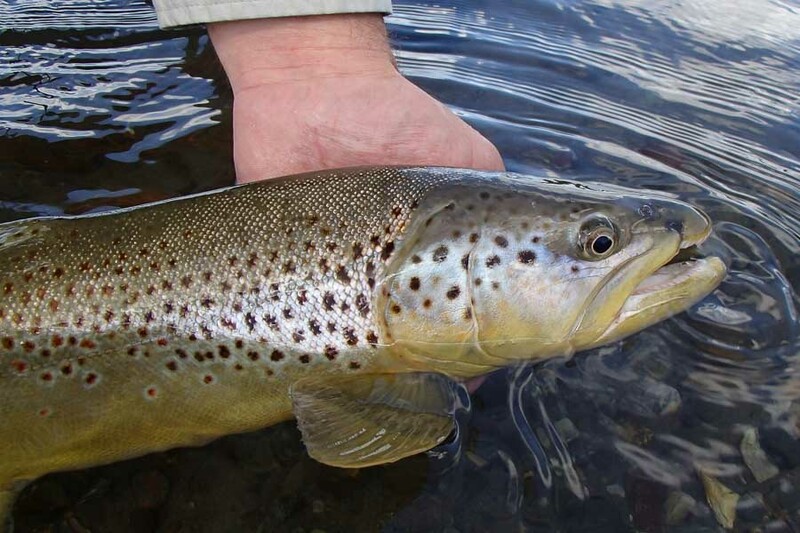 Really large trout focus on big meals such as crayfish, sculpins and other trout. The tendency for big fish to want big meals makes it extremely difficult to catch them on a dry fly. The exception to this rule is during the salmonfly hatch. The huge size of these stoneflies and the substantial calories that each one provides is enough to entice gargantuan trout to the surface. I have personally had clients hook and land massive trout up to 26" in length on salmon fly dries. The thrill of watching the trout of a lifetime destroy a size 4 foam dry on the surface can be the tipping point that turns a perfectly normal individual into a mumbling obsessive Ahab ruined by his search for the next white whale. Various guides to fishing the salmonfly hatch refer to the hatch progressing steadily up the river a few miles per day. A variety of factors influence that progression of the hatch including day length and water temperature. In general, salmonflies hatch when peak water temperatures are close 56 degrees F. The reality of the hatch is that it is always unpredictable. Some years the hatch begins on the lower portion of the river then slowly moves upstream over the course of a few weeks. On other years the salmonfly seems to explode up and down the river. To complicate matters, the intensity of the hatch varies greatly from one section to another (probably due to differences in river habitat). The result is a bit of an educated guessing game to determine where the bugs are each day. When fishing the "hatch" it is important to have as much information as possible about the location of the hatch and then develop a battle plan on where you want to target the hatch: the head, the center or behind. The ludicrous size of the "big bug" is both a blessing and a curse. The massive insect's size entices massive trout to eat them. Every princess has a wart and the same is true of the salmonfly. The same attribute of the large stonefly that gets fisherman so excited (its huge size) is the same feature that causes fishing guides across the West to pull their hair out in frustration. When salmonflies are easily accessible trout literally go on a feeding binge. The robust nature of the insect quickly fills their stomachs forcing fish off the feed. A hungry trout may only need to eat 40 or 50 salmonflies before they are stuffed. The same trout would need to eat hundreds or thousands of blue winged olives to become equally saturated. The end result is that the feeding window of trout during the hatch is compressed and anglers have fewer opportunities to catch a fish with their imitation before the fish quits eating. Generally, the least productive location to fish during the hatch is the center of the hatch where the big bugs are filling the air like military choppers. The few fish that you do catch in the center of the hatch have grossly extended bellies and are often regurgitating salmonflies. The best time to fish the salmonfly hatch is 5-7 days after the peak of the hatch has passed. Nymph fishing can be very good in advance of the hatch and dry fly fishing is occasionally good at the leading edge of the hatch but both strategies are inconsistent and unpredictable. Trout at the head of the hatch are often already filled up from gorging on nymphs by the time the adults start flying. Finding the leading edge of the hatch is also a challenge since the hatch moves so quickly and is variable in intensity along different stretches of water. Many guides, myself included, prefer to target the trailing edge of the hatch for the best dry fly fishing. Trout spend several days digesting their glutenous meals so I prefer to fish at least 4 days behind the hatch. The trout will remember the salmonfly for about 10 days after the hatch. During this window of opportunity, trout are once again hungry and are still looking for the big stoneflies. Since most of the insects have already hatched out there are very few naturals to compete resulting in a great opportunity to catch some very big trout on huge dry flies. The trailing end of the hatch is also much easier to locate since determining where the hatch has been is obviously easier than predicting where it will be next. Don't get me wrong, I love chasing salmonflies, but sometimes intentionally avoiding the hatch is a great plan. During the salmonfly season there are always other rivers (or segments of rivers) where the hatch either is still a long way off, has already occurred, or doesn't come off at all. Fishing well in advance or well behind the salmonfly is often outstanding. The big bug often hatches immediately after runoff ends, but on some rivers like the Madison there is often 2 or three weeks of clear water fishing before the hatch arrives. During this pre-hatch window trout are hungry and opportunistic and there are few aquatic hatches to compete with. After the hatch has passed also produces great fishing. The salmonfly is the first in a progression of aquatic hatches that continues with golden stones, PMD's and caddis. For three or four weeks after the salmonfly has passed anglers can target several other hatches that often produce consistent match the hatch fishing. 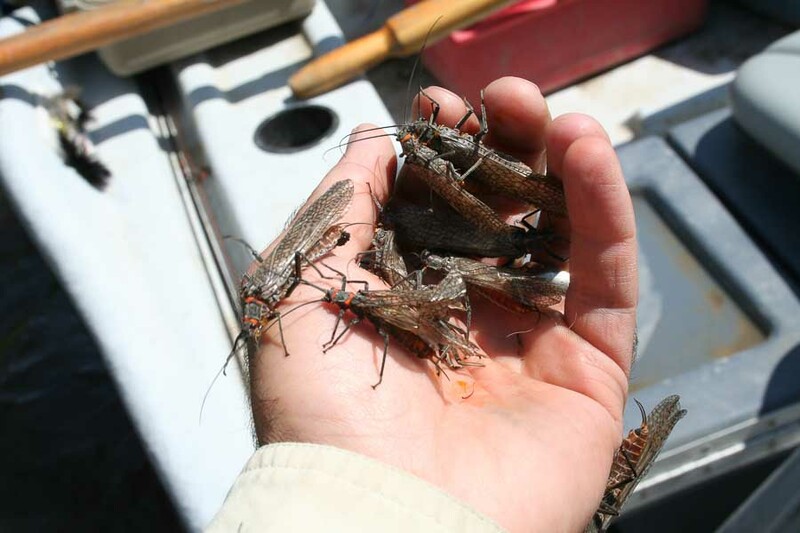 Since many fisherman are intentionally chasing the hatch on other rivers, anglers seeking less fishing pressure may enjoy bypassing the "boat hatch" that often accompanies the salmonfly. Brian McGeehan spends several weeks a year chasing (and avoiding) salmonflies as a Montana fishing outfitter and owner of Montana Angler Fly Fishing.